Built in 1912, the building was constructed by Reno Motor Company and housed a number of showrooms until the mid-1940s. 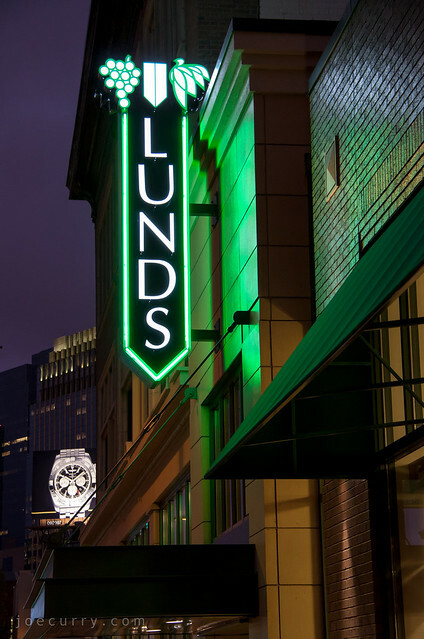 After nearly eight years since it was proposed, the new Lund’s had its grand opening today (on Thursday when I took the photo). As a treat to myself, I stopped in for Bing cherries and gourmet cheese. My cousin Karen is a foodie at the Lund’s in Plymouth, but they didn’t have any samples after I walked home from the Twins vs. Phillies baseball game. A couple other things I love: they have Redbox and now I don’t have to drive to the closest one. They have Caribou coffee. And, they have a separate wines & spirits store, a restored 1914 building built by the Stur-Bullard Motor Company, once home to several car show rooms, including Nash and Ford. I love seeing historic buildings redeveloped for new uses, and I’ll drink to that! Real nice photo – you’ve inspired me to go there some night and take some images of this store. Thanks Michael! I’m sure you’ll be able to capture even better photos, since I’m still learning how to use manual settings on my camera. Love the recent baseball and Loring Park photos on your blog. Your blog inspires me with new places or old places to rediscover since I moved back to Minneapolis last fall.